Home / News / Emerging research suggests a new paradigm for "unconventional superconductors"
Emerging research suggests a new paradigm for "unconventional superconductors"
An international team of scientists has reported the first experimental observation of the quantum critical point (QCP) in the extensively studied “unconventional superconductor” TiSe2, finding that it does not reside as predicted within the superconducting dome of the phase diagram, but rather at a full GPa higher in pressure. Artist's conception of charge density wave domain walls in TiSe2 and the emergence of superconductivity through their quantum fluctuations. The surprising result, reported in Nature Physics, suggests that the emergence of superconductivity in TiSe2 isn’t associated with the melting of a charge density wave (CDW), as prevailing theory holds; in fact the CDW’s amplitude decreases under increasing pressure, but does not disappear at zero resistance. The researchers find that the emergence of superconductivity in this material is connected rather with the formation of domain walls between commensurate and incommensurate phase transitions. The discovery of this new phase boundary has implications for our understanding of superconducting behavior. The experiments, conducted by Young Il Joe, a graduate student working with condensed matter physicist Peter Abbamonte, employed a novel X-ray scattering technique at the Cornell High Energy Synchrotron Source (CHESS) to obtain the first ever measurements of the degree of commensurability of the CDW order parameter. In this, the researchers took advantage of the harmonics of the diffractive optics—usually filtered out in X-ray experiments—to take two readings simultaneously. The wavelengths of two simultaneous photon beams were carefully calibrated, one to measure the periodicity of the crystal lattice, the other to measure the periodicity of the electrons, and compare the two. At low energies, the CDW was found to be commensurate, as expected, but above the superconducting dome, incommensurate behavior emerged as the temperature was increased. The superconducting characteristics of TiSe2 are typical of other unconventional superconducting materials that exhibit the universal phase diagram, suggesting a fundamental connection between unconventional superconductivity and the quantum dynamics of domain walls. 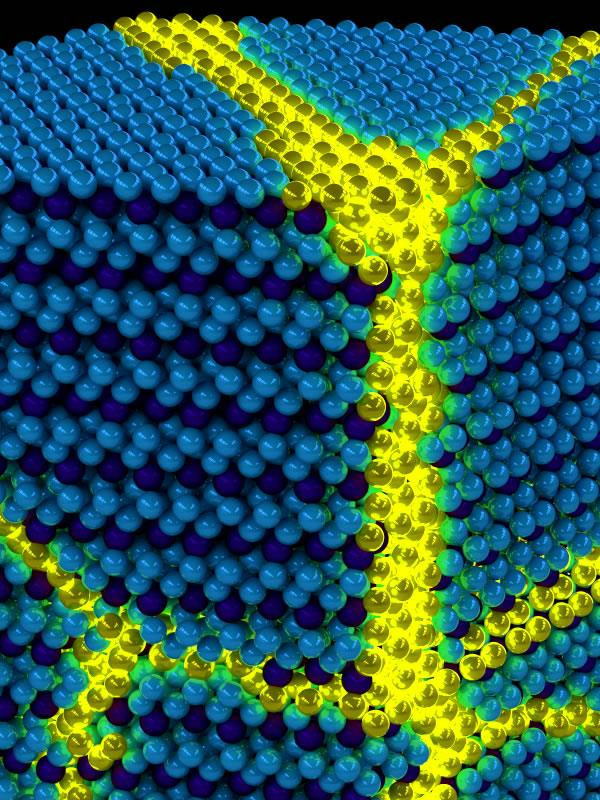 This work sheds new light on our understanding to the theorized connection between superconductivity and other ordered states, such as charge density wave (CDW), antiferromagnetism, or stripe order and could contribute to the eventual development of better superconducting materials, and ultimately to the possible invention of room-temperature superconductors. The X-ray experiments were supported by the U.S. Department of Energy under Grant No. DE-FG02-06ER46285. Young Il Joe, Shi Yuan, and Lance Cooper grew the 1-TiSe2 crystals at the Frederick Seitz Materials Research Laboratory at the University of Illinois at Urbana-Champaign with support from DOE Grant No. DE-FG02-07ER46453. Use of the CHESS was supported by the National Science Foundation and the National Institutes of Health/National Institute of General Medical Sciences under NSF award DMR-0936384. T.C. Chiang’s contributions were supported by DOE Grant No. DE-FG02-07ER46383. The conclusions presented are those of the scientists and not necessarily those of the funding agencies. Contact: Peter Abbamonte, Department of Physics, University of Illinois at Urbana-Champaign, 217/244-4861. Siv Schwink, communications coordinator, Department of Physics, University of Illinois at Urbana-Champaign, 217/300-2201. Image by Young Il Joe.